"Acutely aware of inefficiencies in the firm’s existing internal process for evaluating and clearing conflicts, the Conflicts and Compliance team at Eversheds was ready for a change. According to Kerry Kendal, Head of Operations, the previous conflicts software tool they were using was 'no longer fit for purpose, and generated a lot of data.' With the old system, the Conflicts team was unable to rank data by relevance or eliminate irrelevant search results. As a result, lawyers received lengthy conflict reports that were difficult and time consuming to read. Sifting through them could take hours of valuable time. Kendal adds, "You could develop a false sense of security, if the most important result had been pushed down to #174.'" "Partners evaluating new matters found themselves forced to manually look up client information and financial data – a tedious process that added hours to the conflicts evaluation process. 'With our previous system, we didn’t have access to past search records – so there was no record of our institutional knowledge across the firm,' says Kendal." "The net result was that the Conflicts team found themselves functioning mainly as conflicts administrators who ran searches for the legal teams, and had to undertake extensive quality checks to work around the limitations of the old system – to reduce the firm’s exposure to risk. 'We wanted to move toward a more efficient model where conflicts experts were doing more of the conflicts analysis – not the legal teams,' says Kendal. A more efficient process would save both the lawyers and the Conflicts team time and resources, reduce risk for the firm, and ultimately deliver a better service to clients." 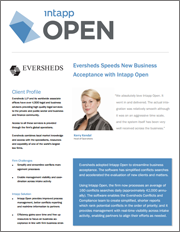 To learn how Eversheds has transformed new business acceptance at the firm, see the complete case study.